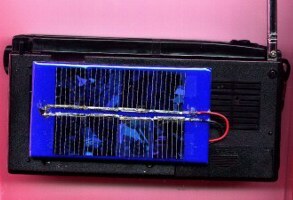 There are many ways of solar converting a radio. We here concentrate on the easiest ways. Where people have experience of wiring, etc, there is almost certainly a more satisfactory way of doing the job! We go into more detail here than with other types of solar conversion which are shown in detail in instruction leaflets. 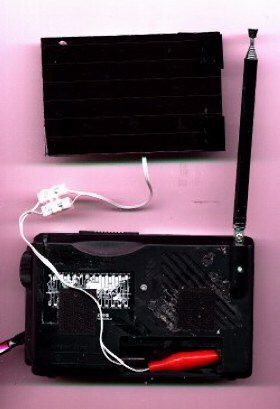 The simplest way of solar converting a radio is shown in the picture opposite where the assembled solar panel has its leads put in contact with the battery compartment contacts. Here crocodile clips are used so as to reach the hidden radio negative spring contact - there are other ways of doing this. If the radio does not work at first, with the panel in the sun, the leads are switched round to give the correct polarity. 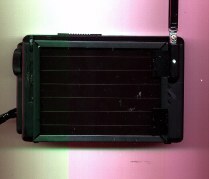 In this particular case for portability, the panel mounts on the radio casing using velcro strips as shown in the picture below. Initially we recommend placing the solar panel in a sunny spot, perhaps on the roof facing the sun, with a long lead to reach the desired position for the radio. Without damp proofing, the panel must not be left out overnight! If NiCds are unaffordable, we suggest experimenting with recharging dry cells! But beware! Providing dry cells are not exhausted, they can be recharged a few times! Rather like heating them up to give a bit more life. Unless the charging rate is very low, they soon tend to leak a corrosive fluid which can attack the circuit components. So we suggest not only constantly checking for leaks but putting pieces of cloth in the battery compartment to soak up any liquid that might be produced. For reasons that have still not been established, small solar panels are not imported into the Third World although they have been available in the West for many years and used mostly for solar charging NiCds in sunnier countries. One 3v panel is shown opposite mounted on a SW radio. It will power the radio even out of direct sun! Obviously it costs more than DIY Solar panels but has the great advantage of being unbreakable and small. We intend to offer such small commercial panels in the future!